With beautiful views, fresh air, and ever-changing scenery that keep you entertained, outdoor running is a restorative and invigorating way to workout. However, this may not be possible due to weather limitations, and that is why you should equip yourself with the best running rain jackets. When it comes to choosing the right running jacket for you, there are certain key features you ought to take into consideration. Such features include waterproofing capabilities, amount of pockets, and many more. One thing you need to be sure about is that the jacket you are going to choose is lightweight. If you are looking forward to staying comfortable and dry during your next run, have a look at the five best running rain jackets, below. The reputation of Charles River Englander precedes it in so many ways. 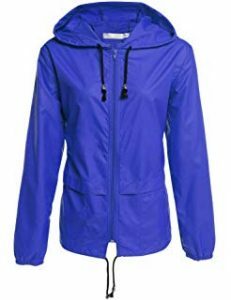 The company is known for making high quality and affordable jackets particularly for runners who are not deterred by rain. These jackets come in a variety of sizes ranging from extra large to small. They also come in an array of colors that suit any personality (navy, periwinkle, black and millennial pink). The Englander has an underarm vent that allows for adequate airflow thus making it breathable. It is also lined with mesh and has heat-sealed seams that ensure you are warm during the rainy runs. 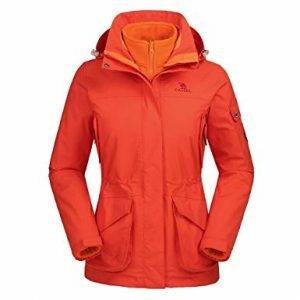 The jacket has a number of features including a bungee-cord hood that allows for adjustable comfort, and an A-line design. It also features reflective stripes that ensure your visibility in the dark. The Charles River Englander is made of 100 percent polyurethane fabric that is tightly bonded to a woven backing thus providing additional strength. It has adjustable hook-and-loop straps as well as hand pockets that are covered with zippers. This jacket offers enough space to the user to carry his or her necessities while running. It has a bonus stretchy pouch where users keep their smartphones secured while running. The Marmot Lightweight Waterproof Rain Jacket offers a great balance between durability, protection, and flexibility. They come in an array of sizes thus finding one that fits you should not be a daunting task. This jacket uses a specialized technology called Gore-Tex Paclite technology that helps in keeping out moisture from the user. In addition, the lower back hem provides an allowance for softshell, thus providing the comfort of not being overheated or restricted. Its hook and loop cuffs, as well as its adjustable hood hem, help seal the user from monsoon winds. The breathable NanoPro fabric and a waterproof jacket will ensure that you are comfortable and dry regardless of how intense the workout gets. Its fabric has densely-packed pores that are big enough to let out water vapor, but small enough to bar water from seeping in. The Marmot is packed with lots of features including taped seams that bar leaks, zipper ventilation openings, and an easily detachable hood. It also has high adjustability in maintaining optimum body temperature. It is also worth mentioning that it is highly convenient as one can stuff the entire jacket inside its interior pocket as soon as it stops raining. All these features make this jacket makes it a wear that is right and fit for users during rainy seasons. 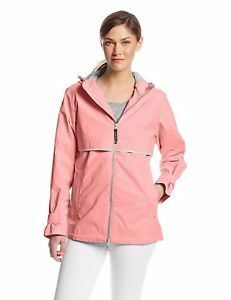 If you are looking for a running rain jacket that offers comfort without the need to wear many layers underneath, then the Ubon Insulated Shell Jacket will be a great choice. Other than that, it is packed with lots of amazing features. It has a removable hood, underarm holes for proper ventilation as well as elastic cuffs thus making it ideal for running and other outdoor sports. This jacket is also equipped with an earphone port to allow for convenient listening as wells multiple pockets that ensure your valuables are safe. The Ubon comes in a variety of sizes from small to extra-large hence it will not be hard for you to get one that fits you perfectly. It’s multi-pockets which include 1 arm pocket, 2 big side pockets, 1 zippered chest pocket, and 1 large elastic mesh pocket. And they are all designed with waterproof zippers. With all the pockets found on this jacket, there is no limit to the things you can store including phones, wallets, keys, gloves, lipsticks, and others. 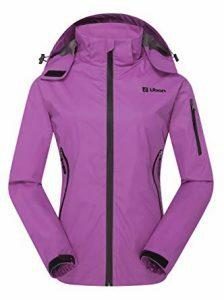 Its Angel-Wing Movement offers an allowance for the softshell thus providing comfort to the user. The Camel’s innovative and unique with its 3-in-1 design comprising a waterproof outer shell and a breathable and soft inner fleece lining. The three jackets in one can be worn separately or together. It is packed with lots of features including an insulated, detachable hood, an earphone hole, tons of pockets and adjustable Velcro cuffs. The Camel Waterproof Outdoor jacket is also windproof as it adopts a unique design and material to achieve this windbreak effect. Its military grade Teflon material features anti-fouling, windproof and waterproof properties that can reach levels of up to 5000mm/H20. All that is required of you is to adjust the windproof hook, zip up the seamless zipper and continue with your run. The Camel has an outstanding ergonomic design featuring two zippered hand pockets, a YKK Bi-directional zipper, secure pockets with a fixture hole for earphones. Its velvet tighter and softer shell as well as a warm-lock fleece inner jacket makes it perfect for almost all outdoor activities including running. CEASIKERY is well known for its quality jackets, and its raincoat windbreaker jacket is no exception. The materials used are carefully selected to ensure that the client is satisfied with the final product. This zip-front jacket has a breathable mesh lining that guarantees dryness and comfort during your running adventures. It is made from a waterproof, lightweight, windproof material that ensures you are protected from the sun making it ideal for any season. The Ceasikery material is made of 100% polyester thus making it really lightweight. It also has sun protection properties, as well as windproof and waterproof functionalities. Below are things to consider when picking up the right running rain jacket. 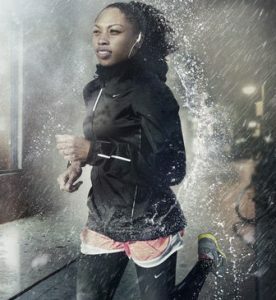 Rain protection is very crucial when you are looking forward to purchasing a running rain jacket. 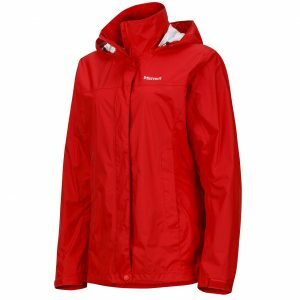 Under this category, there are two types of jackets namely; water-resistant and waterproof. Waterproof jackets offer total protection against rain regardless of how hard it’s pouring. These jackets are for those that are not deterred by bad weather. On the other hand, water-resistant jackets provide little protection against the rain and are generally much lighter. 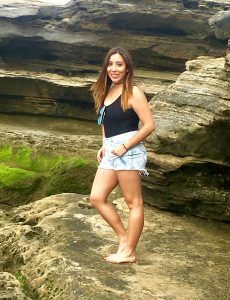 They are recommended for those hiking when it’s just sprinkling or with the chance of rain. Running rain jackets fall under three categories namely those with 2, 2.5 or 3 layers. The least expensive and most popular one is the one with two layers. The one with two layers indicates that the membrane is directly attached to the face fabric. The 2.5-layer jacket is similar but has a laminated grid pattern inside the jacket that offers resistance against abrasion. The 3 layer ones are the most expensive but are also the most durable. Its inner layer is removable and can be worn separately. If you are planning to be outdoors in the chilly weather quite often, then the 3-layer jacket will be the right choice for you. However, if you are not in need of too much protection, the 2.5 or 2 layers will be just okay. There are a variety of shells that are used in making running rain jackets. This takes into consideration how the jacket is made with some having soft shells, hard shells or hybrid shells. Soft shells have an insulating layer and are water-resistant. They are more breathable thus making them suitable for activities that involve sweating often as well as those doing strenuous hikes. On the other hand, hard shells are waterproof, but unlike soft shells, they are not as breathable. They are much stiffer thus better suited for those whose main concern is rain protection. Hybrid shells offer a mixture of both. They have a down or synthetic filling that keeps you warm thus making it a good choice for those going somewhere cold. Running is normally accompanied by intense sweating. By having this in mind, the runner ought to consider a jacket that allows for maximum breathability so as to prevent instances bad odor brought about by excessive sweating. Breathable fabric allows air to move freely around the body. In addition, the material used to make the inner lining of the jacket should have sweat-wicking capabilities. Breathability guarantees the runner’s body a cool and fresh atmosphere during the whole running session. This prevents instances of dizziness, skin irritation and other health issues. This is another paramount factor you ought to take into consideration when purchasing a running rain jacket. Size is normally determined by the layers underneath the jacket. If you are planning to use it in colder climates, it would be better to go for a size up jacket so allow room for movement. If you are planning to wear the jacket in a mild climate going for one that’s your normal size would be just fine. It is without a doubt that the heaviness of your running clothes can influence your speed. When coming up with the list above, I kept in mind the need of having lightweight running attire. The article also took into consideration the abrupt changes of the weather. This rapid change in weather requires one to have a running rain jacket that is portable and packable for those just-in-case situations. This simply refers to the general make-up of the jacket. Soft shells have an insulating layer and are water-resistant thus making them more breathable thus making it good for rain protection. On the other hand, hard shells are waterproof but not breathable. They are stiffer and are best for those that have rain protection as a priority. Hybrid shells are also available. They are a mixture of both and recommended for those going to a cold place as they have an insulating shell that keeps the runner warm. The comfort desired, and general design should help you choose the right running rain jacket. Regardless of whether you are a professional or an amateur runner the list of jackets provided above will be excellent choices for you. Waterproofing and windproofing capabilities are an important consideration when you want to take a run during the rainy days. It is also crucial that you try on the jacket to ensure that it fits well and whether it has the desired warmth and comfort levels. Wear one of these running rain jackets the next time you go for a run.